Some of you have been seeing my tweets throughout the day originating from CMA Fest downtown this weekend. Before I go any farther in talking about my impressions as a Nashville native, I need to make a couple of disclaimers. First, take my tweets with a grain of salt for it is always easier to tweet about the bad things than the good. I think that part of the human condition involves sharing our pain, and some of us do that through Twitter. In spite of how it might look, I am generally glad to have the experience. Also know that today I supervised two 9 year old girls and a 14 year old young woman. That I am still lucid is an amazing thing. Second, I have to share that our tickets were a free gift by a friend and staffer, and those who have no financial investment should be careful in their critique. The chance to attend the CMA Music Festival was something out of our ability and I appreciate greatly the opportunity we’ve been given. Having said that, I also come to this thing as a former event manager and producer who can’t attend any event without a critical eye. I confess that I rarely am able to experience and event or concert on its own terms without analyzing it, and CMA Fest is no different. The weather has been, and will likely be a problem throughout the weekend. The fact is that this event is primarily an outdoor festival, and storms postponed a concert at the Riverfront Stage and completely shut down the concert tonight at LP Field. There really isn’t anything the CMA can do about this, but it does cast a pall over the event. I want to go on record with my concept ( © 2009, Jay Voorhees All Rights Reserved) for an IPhone app for CMA Fest, and other music festivals. The app should be able to work with either Wifi or 3G in order to allow compatibility with the Touch. The basic app would contain all the schedules for all the events of the festival, as well as maps and other general information. This could be updated in real time so that folks would have the latest information in their phones and IPods. What would be different is that every venue would have WiFi available, and as folks came to that venue, they could tell the app where they were (or the app could geolocate) and the app could tell them the name of the artist that is currently performing. Then, if the app user likes the band/singer and wants to buy and download their music, they should be able to click on that band’s name and either go to the ITunes store with their catalog, OR be taken to a website where they could purchase the music immediately. Any developer types or members of the CMA that want to talk to be about this further, come on. According to my kids: 1) Dierks Bentley is hot; 2) Joey + Rory are cool; and 3) Carrie Underwood is stuck up and not friendly. CMA needs to learn from Disney about entertainment for the waiting periods. There is a lot of waiting in lines, and the CMA should have local musicians performing acoustic sets for folks while they are waiting in line, to minimize the grumpiness factor. There needs to be a way to define waiting as an entertainment/marketing opportunity. CMA Fest is populated by a lot of blonde females in tank dresses wearing cowboy boots. No matter their actual age, they all seem to have the emotional age of 14 when in the presence of a hot country singer (see #3 above). I was really disappointed in the sound in the LP Stadium in the General Admission seats up high. My own sense is that there was too much low end in general, but not enough mid and highs to bring the rest of the instruments above the bass drum and bass. While I know that these are the “cheap seats” the least you could expect for a $35 per night ticket is sound that has some degree of clarity and isn’t muddy. After all, you can’t really see that well from the nose bleed section, so it would be nice to have good sound – but then again maybe I noticed it and others didn’t because I wasn’t whistling, hooting, and shouting “I love you Reba) every two seconds during her short set. Okay. Enough. Tomorrow is another day, with two 14 year olds and 1 nine year old. I totally agree with #3–Dierks is great! 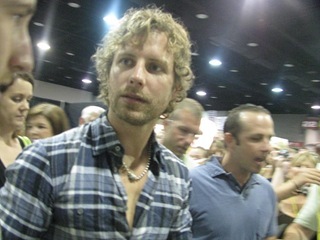 Invite your girls to visit dbcongress.com for all the Dierks scoop! Carrie Underwood is not at all stuck up or unfriendly I have met her before and many other fans who have met her can say the same thing. She is one of the nicest people ever. Your kids may not have had a good experience but coming from her true fans she is NOT mean or rude at all.